Anil Verma Associates (AVA), Inc. was the design and construction manager at Los Angeles Trade Technical College (LATTC) for the first fast track design/build project in the Los Angeles Community College District (LACCD) under Proposition Bond A/AA Programs. For the first Design-build project at LACCD, AVA was responsible for developing the bridging architectural documents on design criteria related to construction requirements. The bridging documents were applied to the contractual bid proposal for prospective bidders. AVA coordinated/participated in the panel for interview, evaluation, and selection of the most qualified bidders. After the contract was awarded, AVA was responsible for the review and approval of design requirements in accordance with the Division of State Architects (DSA) (overseeing agency) regulation, and has served as construction manager to ensure the construction process by the contractor was implemented as designed. As a construction manager, AVA has worked with the DSA Field inspector and LATTC/LACCD to ensure that the entire project was built according to the approved plans and specifications with discipline to maintain minimum change orders and rapid resolution requirements for field conditions. AVA was also responsible for the documentation control to establish the project file, in order to stream-line the close out process for DSA requirements and LACCD client’s punch list process. The LATTC campus student population has grown over the past two decades, but parking spaces have not. 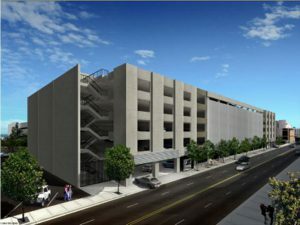 This was the first Design-build above ground parking structure project being built to mitigate parking shortage. The structure is a five story (six level) parking structure with 804 parking spaces. This is a Type 1, post tensioned concrete structure. The total square footage per floor is 42,000 sq ft with a total of 250,000 sq. ft for the entire structure. A z-blade screen adorns sections of the façade along Olive Street above the vehicular entrance to the parking structure. The roof top has been designed to carry photovoltaic panels in the future. The parking structure has two elevators facing the campus entrance on Grand Avenue. The parking structure has an equipped comprehensive communication system, including telephone, data, and security systems to ensure emergency communication to the sheriff station for the safety of the students and faculties at all times, with emergency blue phones and CCTV monitoring cameras at each parking level. The parking structure also has a fire alarm system connecting to the main campus command control center.